I am Vern Hanson, I do not know if you remember me. I worked for your father at Dashew business machines. I would like to know what happened to or where the is the HU KA MANKI. Any information you can remember, would be greatly appreciated. It was my favorite pastime sailing with your dad on the HU KA MANKI. What do you think of the idea of putting the main boom vang on a circular track so the boom angle and boom height (sail twist) can be controlled. I guess this is the sort of system you would have had in your cats many years ago. I guess it would alssuito roachy mainsails. Do you think it could be an effective and efficient means of mainsail control for a large yacht with a shorthanded crew? What do you think about having a washing machine on board a boat for a family of four about to go cruising for a couple of years (maybe more)? We could make the space for it. a well worn design reference as is/was your website. some internet discussion on the topoic but have not found much. The last couple of days we have had a small oil leak on the port engine. Not much – what you see above is after six hours of running – but we wanted to find the source before proceeding. We’ve been using a digital programmable thermostat to control our diesel boiler. This allows us to program four different set of time and temperature during the day. Our sleeping cabin is kept cold during the day, turns the heat on an hour before bed time, and goes to low heat (but still on) until morning, when we are programmed to warm up just a bit. We submit the photo above as a baseline for thinking about anchor size. We are ensconced in Vikingevagen, Norway. A tight, protected anchorage. Water depth is 40 feet (12m) and the barometer is plunging. 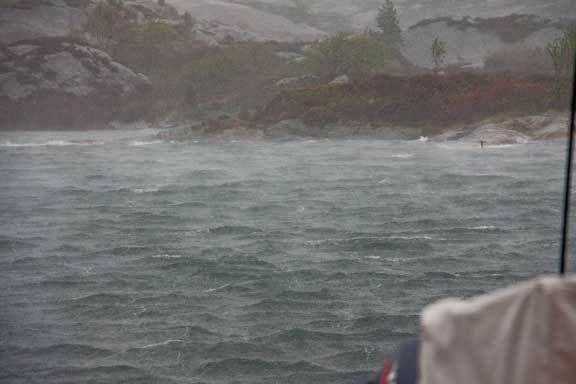 It is gusting 40 knots, and the granite shore is 150 feet (45m) off our stern. This is not a situation in which you want to worry about anchor size. So, how big an anchor is right? Steve, I have a Lavranos-designed aluminum 13M cutter. The bottom has 6 coats of Interlux 2000e epoxy barrier and a couple of coats of Interlux “trilux 33” bottom paint. What brand of bottom paint do you use in warm climates. Thanks. There is considerable discussion about Rocna vs Manson vs Spade floating about. This discussion is somewhat contaminated by the defensive jabbing amonst some of the designer/manufacturers. Given your tacit endorsement of the Rocna, can you give us some real life (NZ to UK via Alaska) insight into where the Rocna proves to be superior and when it does not (e.g., bottom types, fast currents and shifts, storm conditions). Thanks! 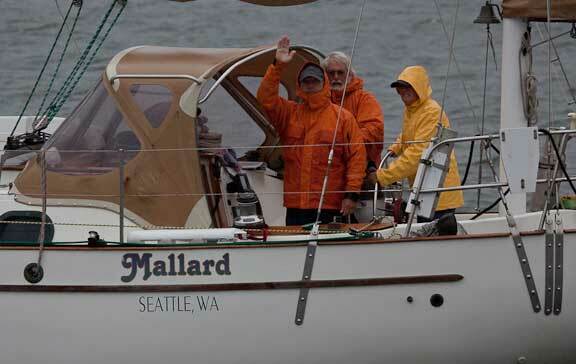 Dave Snow, a Puget Sound sailor sent some excellent questions about our recent blog about crossing the English Channel. We’ll try and answer them here. You’d think London would be bristling with wifi options. There was good service in marinas from Falmouth to Southampton. But we’ve been bandwidth challenged in St. Katherine’s Docks. We see two pay to play wifi options with our high gain antenna and access point. Both – BT Open Zone and Something Wireless – are slow and of intermittent availability. We subscribed to both – roughly US$22. per month for each – so we had a choice. We have been using the same set of Yale Ropes high modulus dock lines coming onto four years now. 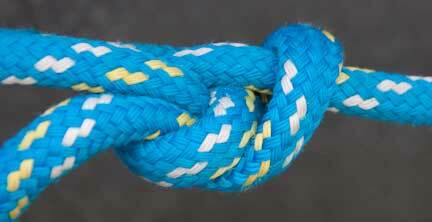 These 11mm (7/16″) ropes are as strong as our normal 24mm (one inch) polyester, weigh a fraction of the latter, and are less prone to chafe. And they are obviously a lot easier to handle. Warming the Bunk – Electric Blankets at Sea? Last summer in Greenland, with water temperature barely above freezing and air about the same, we decided to see how tough we were, and if we could sleep with the diesel heater turned off. A double dose of blankets did the trick. But the pain of warming the cool sheets at the beginning of our sojurn abed disuaded us from further experimentation. Genset Sound Shields – Good or Bad Idea? When we purchased the Northern Lights genset for Wind Horse it was only available at the time with a sound shield. Since we were paying for it we decided to give it a try. However, a hidden salt water leak and less than robust latches convinced us to leave off the side panels. We were not comfortable with having to remove the side panels for routine inspection. Although we have left our boats in many parts of the world, this is the first time where we have had to consider sub-freezing temperatures. We talked to folks from various areas who live in these climates and received all sorts of advice, some of which was in conflict. At the request of a reader, Linda discusses how she handles health insurance while cruising, some new things she’s added to the medical kit, and her experiences getting health care in foreign countries. We’re anchored off Georgetown in the Bahamas. Water is 87F/30C and air about the same. Today the breeze lightened up and awnings, always important in the tropics, became critical. So we took a ride around the anchorage to see how folks were keeping their cool. We’re anchored a mile from a beachfront restaurant to the west of Georgetown in the Bahamas. Amongst the services offered (in addition to cold beer) is WiFi. $15 for the week – not bad by cruising standards. As it is the beginning of the slow season and there are not a lot of users right now, the connection is robust. And with our hi-gain WiFi antenna and “access point” we are able to enjoy the benefits of being connected to the world while anchoring away from the crowd (thank you for installing the system, Troy Bethel!). One of the biggest benefits of this solid WiFi connection is the new (to us) Skype phone system for calling over the Internet. We are just getting up to speed with this 21st century marvel. Today, after digesting the latest metalwork drawings on the FPB 64 from New Zealand (the 3Mb file arriving by WiFi) we had a two-hour phone conference with Dave DeVilliers and Ed Firth who are doing the detailing. Both our drawings and theirs were open on the computer, and we could refer back and forth as various details were discussed. Exactly as would have happened if we were standing at the desk in our land office. The big difference is that we are out here, actually using the product as it was intended to be used. This is the only way to run a business! Our recent foray into replumbing our hydraulic cooling system under way brought to the fore how valuable these heat resistant gloves can be. We picked them up in an Ace Hardware store some years ago. They are made from Nomex or Kevlar (cannot recall which), and for hanging on to fittings which are at 125 F (52 C) they work great. They are light enough to retain a bit of feel, enough so we are able to wrap Teflon sealing tape around small fittings (albeit with some difficulty). For jobs where it is really hot and/or the risk of being scalded exists (as with cooling circuits on the engine) we carry a set of welding gloves. These are not easy in which to work, so they remain new in appearance. The gloves above are worn in the engine room when it is warm, even for casual inspections. With AC power consumption aboard at a personal record for us, we are experimenting with different management schemes. To begin with, we now have all four air conditioning units running. That is a total of 54,000 BTUs of capacity. In addition, the wash cycle is in full swing as this is being written. As the washing machine heats its own water, and the drier is a full sized unit, they really consume the Watts. In addition, it is breakfast time and the microwave is periodically using its 1000 or so Watts. The stop in Acapulco was brief. Eighteen hours to clear out of Mexico with the port authorities, top off the fuel tanks (again at US$2.40/gallon) and check the engine room. The latter revealed that the raw water pump on the port engine had begun to leak sea water and oil from its shaft seals. This is just a couple of hundred hours after the starboard pump was changed, so we now know to rebuild these after 2000 hours. There is a spare on board and the R and R took half an hour. Everything else looked fine. We’re crossing the Gulf of Tehuantepec as this is being written. Conditions are perfect, four to eight knots of breeze from the aft quarter and calm seas (just as predicted by our Expedition routing software and GFS weather model GRIB files). Water temperature has been between 85 and 87 F (29.5 to 30 C), air temperature the same in the evening and a little warmer in the sun. The heated environment stresses systems and potentially crew, unless the correct precautions are taken. Air conditioning on board: The logic behind the compromises. We have a love/hate relationship with our comms gear. We really do like to stay in touch, especially with family and friends, but we don’t like the complexity. And the options keep changing. Prior to leaving for Panama we went through an analysis of what was currently available, our needs, and played this off against our tolerance for hassle (low). Here is what we found. Last spring we set up (with the help of a Best Buy “Geek”) a wireless network on Wind Horse. With a Verizon broadband card on one PC, a printer, and a second PC, this seemed like the right way to go. But then we needed to allow for the Furuno Fax 30 network weatherfax which is connected via an ethernet cable, which forced our Geek into all sorts of contorted computer logic. Now things are even more complex. We wanted to add a high gain WiFi antenna and amplifier so we could use WiFi at a long distance once we leave the world of Verizon. In addition, we now have an Imac (Apple) computer. This makes six items to connect to the network. A couple of new tricks we’ve learned from Troy Bethel, who has been helping us with updating our SSB e-mail system and installing a high gain WiFi antenna. To begin with, secure, dry antenna connections are a must, albeit not easy to do on a seagoing vessel. 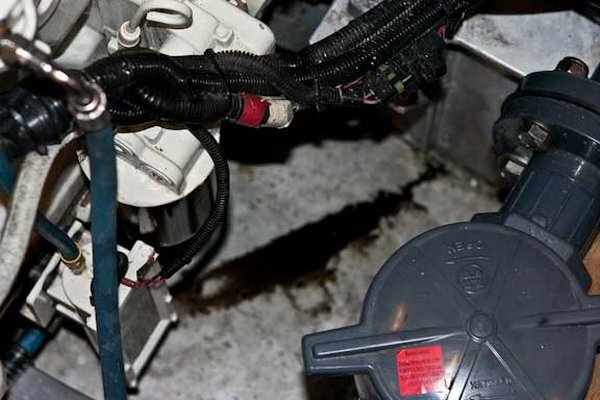 If you have played with boats much, you know that the least reliable item on board is likely to be the pressure switch on the fresh water pump. To make matters worse, these are usually difficult to change. We have been averaging a year of use on our pressure switches, and a year ago decided to install an industrial pressure switch. But it wasn’t until a recent failure during Steve’s evening shower that action was initiated on this long overdue project. Victron Inverter Chargers: Is This Revolution for Real? When we designed the systems for Wind Horse, a key component was the theoretical ability of her Mastervolt inverters to work in phase with the generator so that if necessary, the inverters would handle excess load. In theory, this allowed a smaller genset (our is just 8kW) which would be run at load most of the time. With 2600 hours on our CV Axles (between transmission output flange and prop shaft thrust bearing) and 8000 miles of travel in the offing, we figured it prudent to have a look at this important gear.Removing these is not easy. They reside in the very tight space between transmission and hull. But with the help of Dave Wyman, and expert suggestions from Tom at Ventura Harbor Boat Yard, we had them sitting in the shop after a couple of hours of grunt work. It will be easier next time as we know the system now. It has been 17 months and 12,000 or so miles since we last hauled out at Ventura Harbor Boat Yard. We were probably good for at least the trip to the UK before needing another coat of paint, but with some other maintenance projects to do we figured to get a jump on this chore (at half the cost of doing it in Europe). So we are back at our favorite haul-out site. When we launched Wind Horse we went with a new (to us) insurance carrier, Pantaenius. This is a German firm which acts as a broker, using various insurance markets. They appear to have a large percentage of the Eurpean cruising boat market. What impressed us were the comments we read on folks who had dealt with them on losses, and the fact that they would cover us for areas off the beaten path, with just two of us aboard. With the FPB 64 program coming along we’ve been getting questions about insurance, so we checked with Peter Kelly, who represents Pantaenius in the US. He said insurance rates are currently about seven tenths of one percent. The exact amount varies with which of the coverages are selected. We apparently get a very efficient rate due to the double bottom, water tight bulkheads, high factors of safety, and emergency systems aboard. A couple of weeks ago, as we started to think about “Plan B” (heading to Europe via Greenland and Iceland) we asked Peter what the difference would be in our insurance policy. He checked with the home office and we were advised that there would be no increase in charges. However, our deductible would be increased while we were in Greenland waters to what works out to four tenths of one percent. We were pleasantly surprised to find coverage was available and the increase in deductible seems quite fair, considering the remoteness of Greenland’s cruising grounds. If you would like more information on Pantaenius from the US contact Peter@Kellyagency.net . We have always thought of a properly prepared dinghy as a better option than the life raft in most situations. Our dink on Wind Horse always has its outboard spares/tools of course, along with ground tackle and abandon ship gear packed in watertight backpacks. There is a five-gallon (19 liter) water jug, and two six-gallon (22 liter) gas cans stored aboard as well. We have been testing an “induction” (magnetic) cooktop on Wind Horse. In theory, this takes a fraction of the power of conventional electric units, and we will be using these in lieu of propane on the FPB 64s. Result – this technology works really well. Linda was able to make a Sunday morning breakfast (boil water for coffee, cook bacon, and fry eggs) in just under 14 minutes of cooking time. Average draw off the inverter was 1300 watts during this time. This works out to 330 watts for a rather large (for us) breakfast which otherwise would have been cooked with propane. Last summer we spent a few days hanging out on the dock in Anacortes, Washington, seeing some friends and checking out the local boat building scene. It so happens the dock to which Wind Horse was securely affixed was the perfect height for touching up our topsides. When you consider Wind Horse had been on the go for the better part of 24,000 miles without our once having done any maintenance, it became apparent that the time had come for some serious cleaning. The photo above of the oil pressure gauges on our two engines was taken last summer as we were working our way through British Columbia. On the face of things, the oil pressure on the port engine is a little low and that of the starboard engine alarming. Is this the result of low oil level, a true oil pressure issue from bearings or oil pump, or a bad sensor? Years ago we fitted a strobe light to the masthead of Intermezzo, to serve as a warning light to make sure we were seen by shipping. Later we heard this was not such a good idea, because it was difficult to determine distance off when viewing strobe lights. In the summer of 2006 a 25-foot sailing yacht, Ouzo, was thought to have been run down in the English Channel by the passenger ferry Pride of Bilbao, with three lives lost. The British Marine Accident Investigating Branch (MAIB) conducted an inquiry. While debriefing the ferry’s crew, it was determined that the yacht did not show up on the ferry’s radar, but was seen at the last minute by the watch stander. In typical MAIB fashion the report goes into exhaustive detail about the yacht, the ferry, their respective crew, electronics, even types of eye glasses (with some interesting findings about photochromatic eye glasses). They discuss in detail maintenance issues about yacht running lights, including the information that the aging of plastic running light lenses reduces the transmission of light. 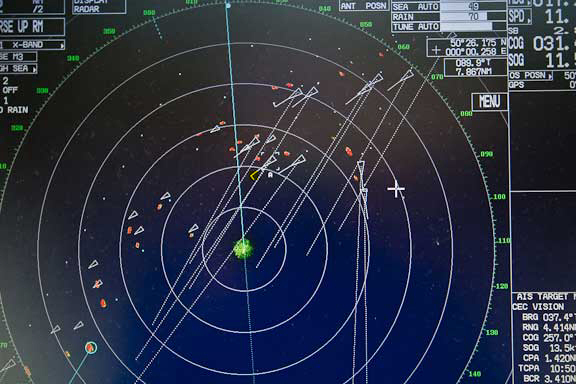 A second report resulting from the MAIB investigation focuses on the various types of radar reflectors fitted to yachts and how they show up on the ships’ radars. The conclusions of their testing on this subject are sobering and bear careful reading. To download a copy of the Radar Reflectors report (a 2.1 MB PDF file), radar_reflectors. To download the MAIB report on lessons learned from the collision (a 1.4 MB PDF file), click here. This tool is ideal for working where a standard crescent is too bulky or thick, and a channel lock does not have the grip power you need. You can order these in various sizes from most tool suppliers. Googling “Knipex” will get you a bunch of websites to check. The air vents for the water tanks empty into the forepeak and engine room. We rarely fill these tanks, but when we do, we just wait until the bilge pump starts to cycle, indicating the tanks are overflowing, to turn off the hose. You can imagine our surprise when we heard the high water alarm sounding. We turned off the hose, and then checked the engine room. There was four inches (100mm) of water in our usually dry bilge. The big PAR diaphragm pump was running, but it wasn’t pumping (and as a result was quieter than normal). Most of the time when we clear into a US port after being outside US waters, the process is quick and easy. In all the years we’ve been doing this it has also been pleasant, with just one exception. Clearing into Roche Harbor in the San Juan islands from Canada was no different. Occasionally propellers will “sing”. This high-pitched whine is the result of blade harmonics and the blade interaction with surrounding structure. If you have an even number of blades there is more chance of singing occurring. Typically this does not happen through the full RPM range, but it can be extremely annoying. Prop manufacturers deal with this by putting on a wavy anti-singing edge. In our case, the current set of propellers have a wavy shape to their trailing edges. Our previous props did not have this and were very noisy. So, we removed them and had a slight cup added which got rid of the singing and effectively added a bit of pitch. When we put on our latest set of props they were quiet except for the starboard prop at 1300 to 1500 RPM. Since we do not operate in that range we ignored the issue. But we found that at heavier displacement the singing would move up to the 1700 to 1800 RPM range and we do occasionally run at this speed. Not wanting to remove the starboard wheel and take it to a prop shop we asked John Hall of Premier Propellers if there was anything we could do on the boat. “File the aft side of the trailing edge for four or five inches (100 to 125mm),” was John’s reply. Although we have a dry suit aboard for cold water maintenance, we waited until we were in Desolation Sound, with its “warm water”, to do the job. Using a medium coarse flat file we took six light passes at each blade. The amount of metal removed was minuscule. You could see the bronze colored flakes in the water and there was not much material. However, we figured it was best to do this a little bit at a time to see what would happen. We picked up the hook and went for a test run and were pleasantly surprised to find no more singing. So, if you have a singing prop, try a little underwater filing, on the aft side of the trailing edge. This is a radar image of one of the anchorages we’ve visited in British Columbia’s Desolation Sound. The radar is on quarter mile range, so each range ring is 300 feet (90 meters). We’re in the center of the image. There are 36 boats showing radar return! We’re anchored in Gowland Harbor on Quadra Island, across from Campbell River in British Columbia. The harbor is pleasant, and most important, our Verizon cell phone and broadband Internet connection are working. We’re here for a few days staying connected, catching up on a backlog of work. We can’t, however, spend all day online. At some point we usually take a tour in the dinghy. This time took us to a small marina to see if there was anything of interest. We mainly saw powerboats, plus a pretty Vancouver 27 at anchor; and there was one sailboat with the nicest looking radar mast we’ve ever seen. Here’s a cool tool that Linda first spied on a Canadian boat. It looks like a small tennis racket, with metal strings. There’s an electronic circuit in the handle which runs on a pair of AA batteries that puts a high voltage charge into the strings. All you have to do is touch an offending bug, and ZAP, it is toasted. We picked one up in the super market in Prince Rupert for $3.95 and it really works. We’re guessing these are available all over. As you may know, the galley tends to be a key element in our cruising. And in the galley, the oven is the most important piece of gear. This is particularly important on passages where an inventory of home-made cookies is an essential component of our routing. You can imagine, therefore, our chagrin when our Seward stove’s oven started to act up in Alaska. Discussing the symptoms with the guys at Sure Marine in Seattle led us to the belief that our “mercury valve”, which controls the oven, was again acting up (we’ve already replaced this once). What to do? Survival training, Part 6 of 6: Life rafts. Survival training, Part 5: Immersion suits. Survival training, Part 4: Man overboard.